Browse the Tartan Database. When you select a Tartan you like, please write the full name of the Tartan as it appears in the database into the text box below. Please ensure you copy the entire code of the tartan to prevent a delay to your order (e.g. Hunter Muted Bat 13). Our Top Stitched 8 Yard kilt is made to measure with the same standards as our Premier 8 Yard Kilt. The only noticeable difference is that we top stitch the pleats which in turn speeds up production, allowing us to charge a lower price. This is the perfect kilt for someone who is looking for a high quality 8 yard kilt but is on a budget. If you need a custom made kilt to your measurements within 3 weeks, we can rush the delivery so it is with you quicker (additional charge applies). 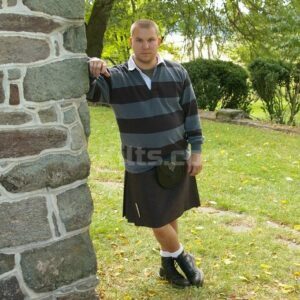 This is not an option we have with our more expensive 8 Yard Kilt. 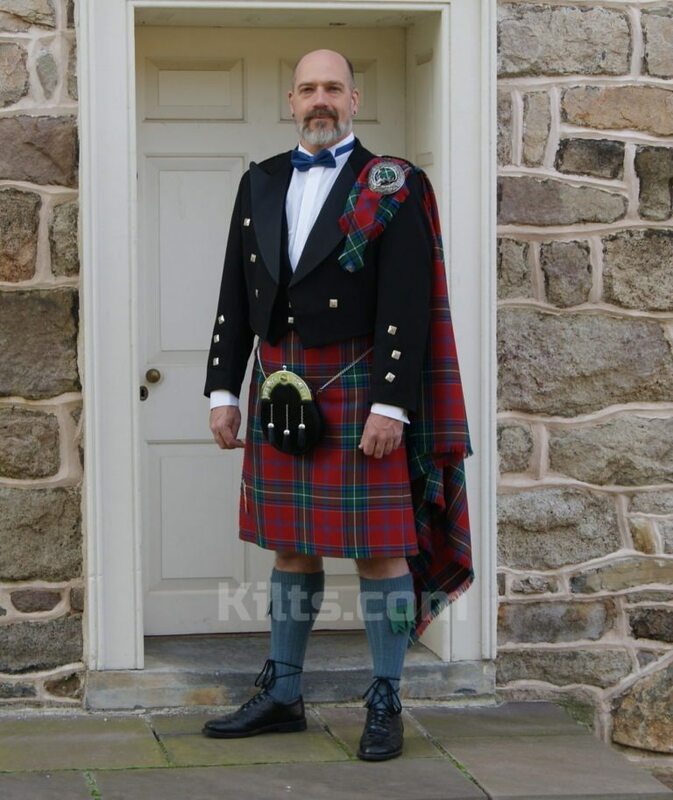 Our Top Stitched 8 Yard Kilt is ideal for both formal and informal occasions depending on when you need to wear it. Fantastic for a wedding, but it will also look great with a t-shirt down the pub. 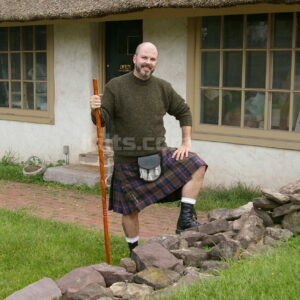 – We use 8 yards of wool cloth for this kilt. – Depending on the tartan chosen, we use 13 or 16 oz wool. – It is only suitable to be dry cleaned, so make sure you don’t put it in the washing machine. – Our Top Stitched 8 Yard Kilt is made with such high quality that it easily holds a crisp pleat. Ironing the kilt is a breeze. – Custom made to your exact measurements that you provide. – The kilt is top stitched which means the stitches are able to be seen, but only when you look really close. – The pleats of the top stitched kilt are between 0.8” and 1″. 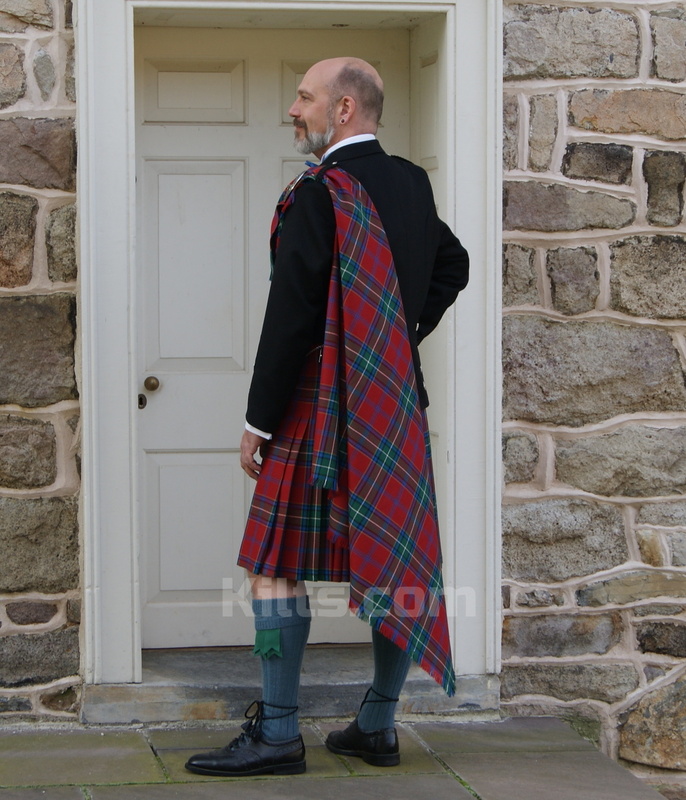 – This kilt, like our Premier 8 Yard Kilt uses a “one thread margin of error”. – We taper down the fell to make the kilt perfect for your body shape. – You will get an excellent pleat “swing” because of the length of the kilt. More so than the 5 Yard Kilt. 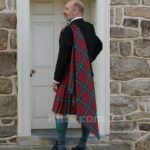 – For added comfort, the kilt is fully lined with cotton liner. – To make the kilt long lasting, we make use of internal horsehair canvas designed which reinforces the kilt. – The kilt is 90% machine sewed and 10% Hand Sewn in the UK by one of the finest kilt makers in the world. – You will notice that each kilt comes fitted with high quality leather straps. They are neatly finished with intricate knot work & there are also strong cast buckles. 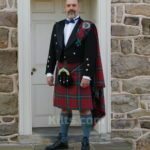 – For adding a kilt belt, the 8 Yard Kilt comes with two belt loops on the back.